In January, 1932, Waterloo, New York, welcomed Robert Campbell, President of the Hercules-Campbell Body Corp. of Tarrytown, New York, accompanied by Vice President Vincent. Perhaps a reason for their interest in Waterloo was the $.20 to $.40 per hour local wage levels, quite depressed in these early years of the Great Depression. 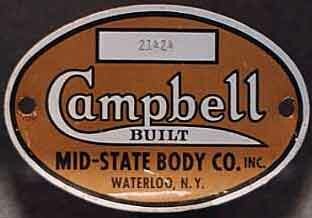 Campbell took over the factory and business of Waterloo Bodies Inc., renaming it Mid-State Body Co. Inc., and undertook manufacturing automobile station wagon and truck bodies. Henry W. LeClear of Waterloo Bodies Inc., had been acquainted with Mr. Campbell, had manufactured truck bodies for him, and had made known to him the sort of products that could be produced in the plant. Mr. LeClear continued to be associated with the concern until his death and was instrumental in its success. In May of 1939, Mr. Campbell purchased the car barns, repair shop and local office of the former trolley line, located on West Main St. in Waterloo, just west of the village, and turned them into a manufacturing facility. The west building was greatly enlarged and in it, the Mid State Body Co., Inc. and the Hercules-Campbell Body Co., Inc. manufactured stakes, van and special bodies, and assembled Wayne buses for schools, until the big fire of 1947. Karl Bernhardi (who recently celebrated his 84th birthday) was superintendent of Campbell's Tarrytown plant, and Campbell tried to persuade him to move to Waterloo to superintend the entire operation. In 1938, Campbell finally got Mr. Bernhardi to commute several times from Tarrytown to check out some of the Waterloo operations. In 1939 he moved to Waterloo permanently and in 1942 became General Manager of the Waterloo plant of the Hercules-Campbell Body Co., Inc. He held these positions until 1956 when he left the firm to start his own company, the KB Truck Equipment Co., Inc.
Mr. Bernhardi's right hand man all these years was Mr. Henry Mosher, also still living in Waterloo. 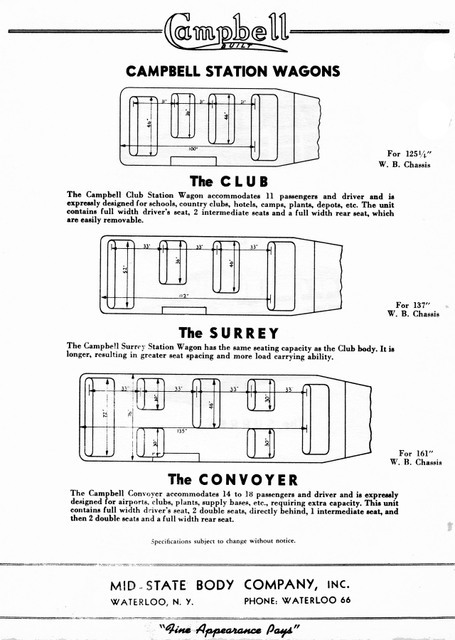 Mr. Mosher came to Mid-State when Mr. Campbell bought the Geneva, (NY) Body Co., Inc. after its owners had died. Henry Mosher was a forman at Geneva. Mr. Bernhardi found jobs for some of the Geneva employees, including Henry Mosher's father and brother, and moved all the machinery to Waterloo. Bill Richardson was Superintendent at Mid-State assisted by Carl Carlson and Warren Raynes, and there were meant dedicated employees, and the very best wood and metal craftsmen of the area. Mr. Bernhardi was pleased to tell us more of his experiences during the boom times of woodie body building. "In 1928 when I started to work in Tarrytown, we received all the commercial bodies knocked down in crates, and the suburban bodies complete, in freight cars from the Servel-Hercules Corp. of Evansville, IN. After 1932 they started coming out of Waterloo, NY and were more streamlined with crankdown windows and curtains all around. In Tarrytown, we started making glass enclosures for some suburbans, mostly for Big Real Estates. Since it was expensive, very few were made and only one man worked on this job. In 1936, after the Hercules-Campbell Body Company had moved into a new building in Tarrytown, a new station wagon was created in a room next to the boiler room, sealed off for security. It was streamlined, with front door crankdown windows and ventilator windows. The rear side door windows were also of the crankdown type, with sliding side windows, and a lift gate tail gate. All equipment had safety glass. After months of work, it was shipped by trailer to Waterloo for manufacturing. Meanwhile, Mr. Campbell and Mr. Vincent had worked hard to convince the Chevrolet Company that this would be good business. We started receiving passenger cars with windshields form the Tarrytown Chevrolet plant and shipped them off to Waterloo on car transport trailers where the wooden bodies were installed and the assembled car then return shipped to Tarrytown. After a final inspection and a few adjustments, the dealer to whom each car was assigned from the Hercules-Campbell plant would pick it up for delivery with his customer. Dealers came from as far away as California. Delivery was slow at first, but picked up as production increased. It was a seasonal market also. 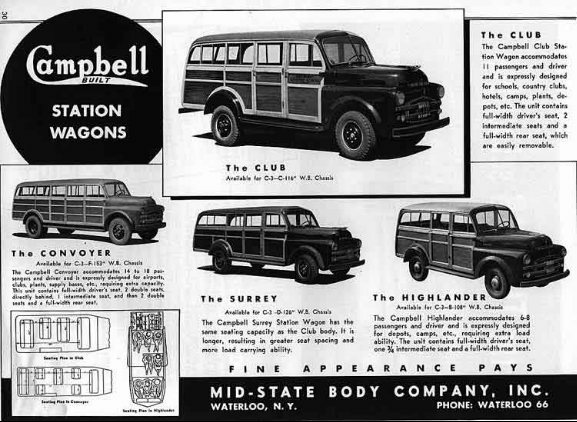 In 1940, Mr. Campbell and Mr. Vincent negotiated a contract with General Motors' Chevrolet Division as exclusive supplier of station wagon bodies. The bodies were completely finished and shipped in freight cars, eight per car, with equipment of special racks and tie downs, to all Chevrolet Plants, three freight cars per day, five days a week. In 1939 our contracts had still been small, but now production increased into thousands. Waterloo, NY was enjoying prosperity again. People were smiling again after years of depressed economy, and the smokestacks were again busy. Even today (1987) people in Waterloo still talk about this, because of the wages they were getting at that time. Stop today and talk to these old timers, you can still find them by the dozens. The contract was canceled after the outbreak of World War II. General Motors paid off all the costs for materials, assembly line changes, etc. for 1942. Only the year before we had started to make the Highlander on a half ton commercial and three-quarter ton chassis, and the Surrey on a one-ton chassis. These were to fill in during the change over from the old to the new models. After the war started we received 200 new Chevrolet two and four door passenger cars which we were to cut off the bodies from and install station wagon bodies which would carry eight passengers. We also mounted bodies on Wayne buses, painted in olive drab for camouflage; and built bomber motor shipping cases, play pens, and small three-wheeler toy airplanes painted red, white, and blue. Our main efforts became cutting down all makes of passenger cars to install station wagon bodies. We mounted the Campbell Commuter wagon bodies on Chevrolet passenger car chassis, and extended them with a 24" "little giant" extension. This body was also installed by us on a 1-1/2 ton dual wheel chassis, vehicles that could carry up to 14 passengers. Our yards were overflowing with cars and trucks, and deliveries were running 6 to 8 weeks. The government had stored two hundred old Plymouth taxis from Philadelphia throughout the war, and released these after the war to a dealer who shipped the majority of them were shipped to us in Waterloo. We removed the bodies and mounted station wagon bodies on them. On a very cold windy night, December 19, 1947, the plant was discovered to be on fire. The fire originated in the paint shop and was fanned by strong winds on a night so cold that firemen were physically unable to do their best. It was soon a conflagration. Despite the combined efforts of the Waterloo, Geneva, and Seneca Falls fire departments, the fire raged beyond control consuming the whole building. The firemen were able to save the large high brick building to the east. The loss was about $150,000, including the building, stock in the plant, and some twenty station wagon bodies in progress. A dealer from Malone NY, was on his way at the time to pick up a twelve foot stake body, unaware of the fire and the burning of his order. He drove up quite surprised and discouraged. I was able, with a few employees over the weekend, to redo his unit in the undamaged building and he was on his way home Monday. The story got around to the dealers of this kind of dedication and teamwork that we had discussed in the those long ago days. I subsequently directed the rebuilding of the entire plant. From the late 1940's until 1956, mostly commercial bodies were manufactured, and export became our main business. The bodies were made out of the cross members, and floor, seat frames, and a roof frame covered in basswood slats. The body framing was of ash with 1/4" Philippine mahogany waterproof plywood panels dipped in a "Woodlife" solution. The roof covering was of cotton cloth often impregnated with rubber, flexible and very resistant to water. Under this was cheesecloth with blue wadding for insulation and cushion. The wood body was also treated with plain wood filler and the paneling with mahogany wood filler, rubbed down with sea oil, a very tough woodwall stringy material, very smooth, used in place of fine sandpaper. The wood body then got two full coats of R190 DuPont exterior varnish in an 80 degree spray room and moved into a drying room. After drying, the body was lightly sanded and a final coating of varnish was applied. From there it went on to the trimming and finishing room and then was loaded into boxcars. The workers who installed the roof covering were called "Tack Spitters" as they would put a number of tacks in their mouths and spit them one at a time onto magnetic tack hammer, driving it into place to fasten the covering to the wood every inch, all the way around. On corners the spacing was reduced to 1/4". Many tacks were inadvertently swallowed and joked went around about how nobody suffered any side effects or became sick from all these tack swallowing years. Right after the war, the big car makers were unable to resume full production as quickly as they had predicted and so a demand arose for putting station wagon bodies on used car chassis, and business really boomed for us. We were making station wagons out of any used car. The trucks in half, three-quarter, one, and one and a half ton sizes, were all new as these had continued to be produced during the war. But they were in short supply. For these used vehicle conversion, our specs read as follows: "For car, new and used, you are to supply us with passenger cars with complete front door hinges, windshield, cowl, and wipers, including metal cap above windshield, also floor pan (minimum 36" from cowl post), front floor mat and seat regulating device, rear fenders, rear bumper and finished color desired, but with doors, glass, trim and with all seats and rear trunk lid deleted. For popular truck 1939-1947, you are to supply us with chassis complete with windshield, cowl, including metal cap above windshield, instrument panel, complete front door hinges, floor mat, full length running boards, rear bumper, rear tire carrier, windshield wipers and finished color desired, gas tank to be mounted between chassis frame and drive shaft. Panel types are acceptable, however no salvage parts will be returned. All doors and seating should be removed by dealer before sending us chassis. The dealer could drop off a car or truck at the Hercules-Campbell Body Co. Inc. at the Tarrytown NY, or Cambridge MA, plants at no extra cost and we would drive it to Waterloo, many coming from as far away as St. Louis, towing on a towbar. 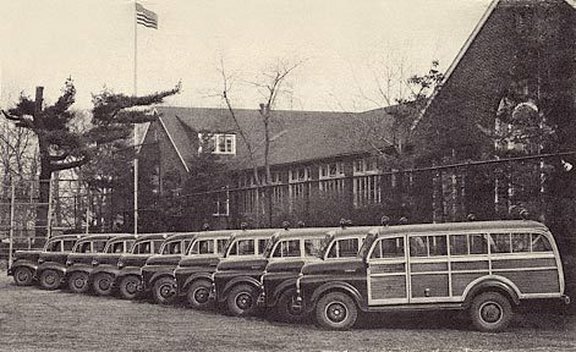 On any given day, you could see these station wagons on the roads, especially over weekends, when our plant employees would drive them back to Tarrytown or Cambridge to earn some extra dollars. We even had a female driver. It was a pleasant trip with the completed station wagon but a pretty rough one in winter driving with a stripped car with only a windshield in front and a roof over your head, and on the commercials just the windshield. The pay was $10 for a single trip, and $15 for a round trip plus $3 for meals and railroad fare if there was no vehicle to be driven back. One time east of Albany on Rt. 9 a driver enroute to New York city for an export delivery, in a Fargo with right hand drive, was met by a state trooper heading west. After passing the Fargo the trooper swung around. The driver didn't think he was breaking any law but was feeling a little shaky. The trooper stopped him and asked him about the right hand drive, something he had never seen before. He requested that he be allowed to test drive the Fargo. They switched vehicles and continued on about ten miles. Drivers heading the opposite way were surprised by what they were seeing and those driving behind did not attempt to pass. After stopping the trooper commented on how easy the Fargo was to drive, got into his car and headed west. Our driver drove onto New York quite relieved. In order to increase our productivity and improve employee attitude, I initiated a bonus system which included everyone right down to the sweepers, all on the same level, and for months most of our employees were making more on bonuses then on their regular wages. When I first proposed this to Mr. Campbell he did not like it, especially at the rate I suggested; $.50 for the fourth vehicle, $.75 for the fifth, and $1 for every one above that. Production increased at once to six or seven daily, and occasionally eight. Many workers became afraid the bonuses would be cut, even after I assured them it would not happen as long as I was in charge of the operation. We had employed women during the war, and continued to do so afterwards. They were good workers, efficient, very pleasant, and less troublesome. By 1949 the used car station wagon business declined and new car makers were changing over to wood grain decals glued to steel paneling. Our wooden station wagon business for passenger cars collapsed. We continued making such bodies then only on truck chassis. Major customers were Chevrolet for domestic use, International, Ford and Chrysler, Fargo right hand drive, Dodge for domestic and export, and a few smaller Macks. The export business became very profitable for a while. After a change in management early in 1956, the plants went bankrupt in early 1957, except for the Cambridge, MA plant then under the management of Mr. Campbell's daughter and her husband. This plant carried on a few more years, having escaped the bankruptcy procedures by changing its ownership and name to the Hercules-Campbell Co. of New England. Mr. Campbell himself moved to Yarmouth, ME and died in Portland after a short illness on August 30, 1957." This article was compiled from Mr. Bernhardi's recollections by National Woodie Club member Roger Mack of Geneva, NY.